These remarks started life as a series of short posts on Google+. But no-one uses Google+, so I’ve archived them here. 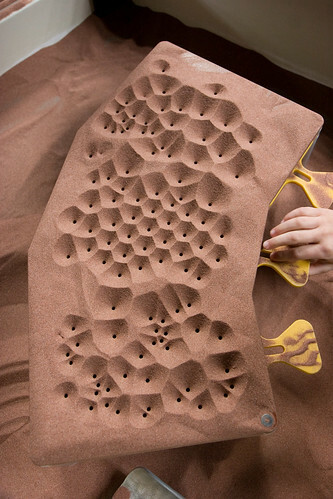 I: you can make Voronoi diagrams using fine sand and blocks with holes drilled in. What’s a Voronoi diagram? In such an image, the plane is divided up into cells around sites, such that the closest site to any point is the one in the same cell. Thus the boundaries are equidistant between sites; for the sand, those are the raised ridges, with the sites being the holes. There’s obvious applications to mapping, say, your nearest coffee shop; an early application was tracing the source of a cholera outbreak to a particular water pump. But it also explains natural processes that involve growing or spreading, such as the patterning of giraffes! If you draw a shape out of straight lines then -even if it has holes, such as the letter A – there’s a way to fold a piece of paper such that a single straight cut will give you something which, when unfolded, is the shape you wanted. (Some example folding patterns which we used are at http://howtofoldit.org/ ). For more details, see The Fold-and-Cut Problem. Robotic birds, from gliders that can land on a perch, to flight via flapping wings. V: The complexity of games and puzzles. For instance, a common question in the study of games is whether there’s a way to determine if you have a winning move this turn- the ‘mate in one’ problem for chess. It turns out that if you generalise Settlers of Catan to arbitrary-sized boards, then you can’t even feasibly handle the ‘mate in zero’ problem – that is, determine if you’ve already won! We also learnt of the hardest game in the world, Rengo Kriegspiel, which is blindfolded team Go, and turns out to be undecidable.